Huge comfy beds, nice breakfast delivered to the room. Loved the hot tub with a view of the mountains. Incredible views, private hot tub was perfect, lovely spot for early and late walks for the dog, super comfy bed, lovely provisions in fridge and at breakfast, being able to hang with our pooch! it’s amazing location in the river , very comfortable and beautiful !! Idyllic setting and incredibly well finished from top to bottom. Lock in a great price for RiverBeds Lodges with Hot Tubs - rated 9.1 by recent guests. 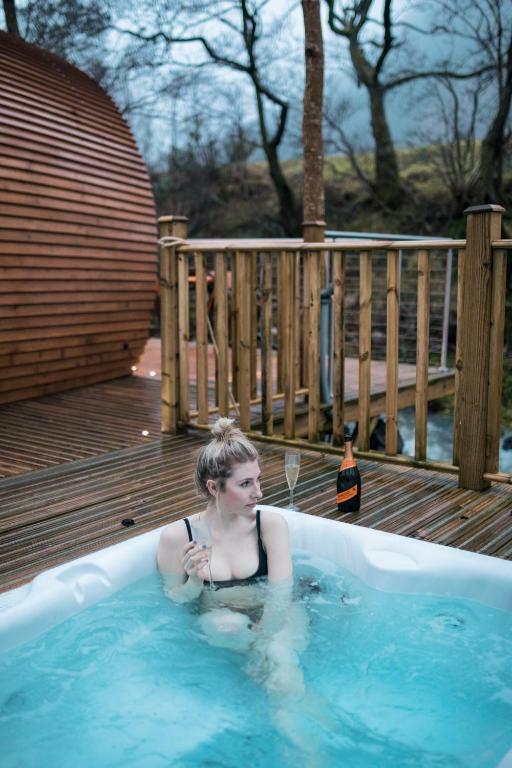 Guests not only enjoy their own hot tub, but can also explore the nearby woodland, mountain paths and riverside walks. Each small lodge has en-suite facilities, a kitchenette fitted with a microwave, toaster, coffee maker and fridge. RiverBeds features free WiFi throughout the property and parking is free too. Guests can enjoy a meal at the on-site café during the day. You can engage in various activities, such as golfing, hiking and Segway tours. RiverBeds Lodges with Hot Tubs has been welcoming Booking.com guests since 6 Jan 2016. When would you like to stay at RiverBeds Lodges with Hot Tubs? This apartment features a microwave, iPod dock and toaster. Twin rooms can be made, subject to availability and by prior arrangement. Please notify the property by 09:00 on the day of arrival at the latest. This apartment features a kitchenette, private entrance and seating area. Hide away in one of the amazing luxurious river-side lodges and enjoy a warm welcome and great Scottish fayre in the Club House Cafe. Each Riverbed is a self-contained unit comfortably sleeping two with ensuite facilities. RiverBeds are an exciting addition to the Dragon's Tooth, which until now has consisted of a Golf Course, an Activity Centre and the Club House Cafe. Callum has four elder brothers and sisters; he's grown up in a turbulent world! The calm of the Dragon's Tooth Estate is a natural home for a natural in hospitality, and his role as Operations Manger he looks forward to meeting you all. James is Business Development Director and has his eye on our next family project (whilst keen to know how we can make RiverBeds even better). Father Laurence is a hotelier to heart. A hospitality graduate of Surrey University, he turned qualified accountant and then joined the family hotel business in Glencoe Valley in 1984. With parents and wife Morag, the family business grew to four hotels on the West Coast until all 'retired' in 2010. We are located right by Loch Leven and are an ideal base for exploring all the local area has to offer. Fort William is around 30 minute drive and Oban around 45 minutes. The Dragon's Tooth is home to the remarkable Dragon's Tooth Golf Course, a challenging 9-hole gem described as "the best 9 hole in Scotland". Enjoy the fun and exhiliaration of Segway Tours or the laughter and enjoyment of Laser Clay Shooting or Archery. There are many beautiful places to explore locally on foot or by bicycle (the Sustrans National Cycle Track passes through the estate). House rules RiverBeds Lodges with Hot Tubs takes special requests - add in the next step! RiverBeds Lodges with Hot Tubs accepts these cards and reserves the right to temporarily hold an amount prior to arrival. Please inform RiverBeds Lodges with Hot Tubs in advance of your expected arrival time. You can use the Special Requests box when booking, or contact the property directly with the contact details provided in your confirmation. Found the greeting very inhospitable from staff and that didn’t improve during stay. Brought this to one of the owners attention in addition to a query on 2nd day. On final day said owner completely blanked us. We got a great last minute deal but wouldnt pay the full amount they ask normally. Not cheap - one for a v special occasion. When it was a bit raining we thought that if there was some sort of canopy for the tub would be great so you could remain in the fun and not get your head wet with the rain . in the property have just one cafe, don’t served food , the place for eat more close is 20 min from there in the restaurant from another hotel ( amazing food), the coffe shop close 6pm , só don’t have how you buy water our something like that in the night , and DONT HAVE ACTIVIES available , there say COURSE of golf , but don’t have teacher any material for that , you need bring your , archery , you can do just 9 Pm ( But the check-in is 3pm and check out next day 11 am) , the segway start 3pm só if you take 10 min for take the keys you can’t do no more !!! it’s a beautiful place , exactly how in the picture , but no very organised PS. “ The filter of the hot tube was very dirty , so when the hidro start work , the water start be little brown in the coners! Bit expensive and no CCTV at car park, our car tyre has been slashed and we’ve had to pay £140 for a new one with no CCTV. Raging. Big Window was not the cleanest my partner had to clean it before bed.could smell the dampness from it before it was cleaned. Spider webs on roof above door. We arrived late in the evening and there was no map to the lodge. I know there’s only 8 but it was quite dark and difficult to make out the numbers. 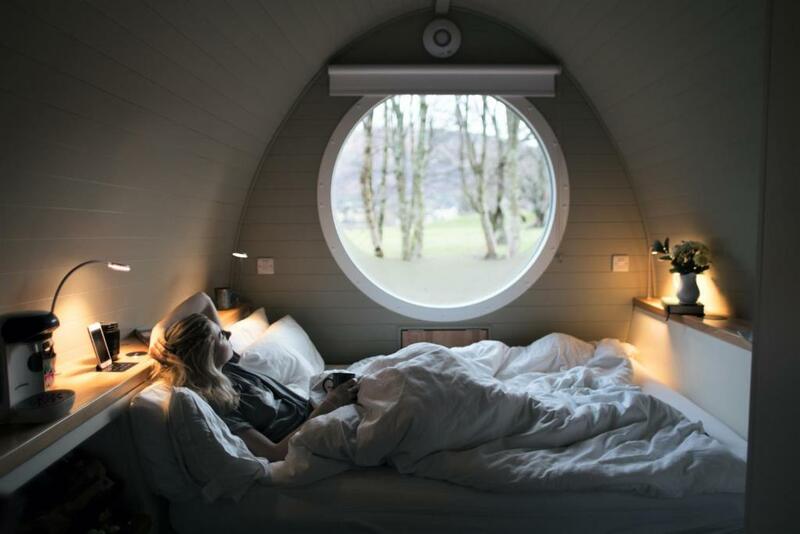 Lovely wee pod! Bed really comfy had a great sleep! Hot tub was amazing and thank you for the lovely breakfast. Nothing bad to say about this place. Had everything I could of wanted.